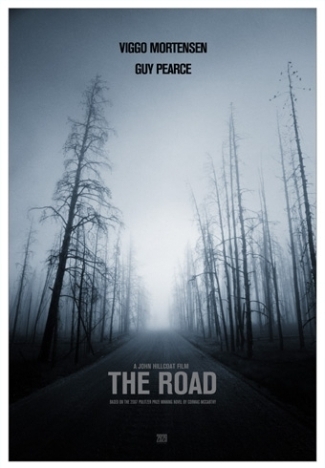 The Road is the story of a man and his boy trying to survive after an apocalypse. This somber tale earns a 7. Viggo Mortensen stars in this bleak and moving journey. He artfully projects the desperation and hope of a loving father trying to protect and to inspire his son in the face of humanity’s end and of the desolation of plant and animal life. His depth and expression fill in for the slow, thoughtful pace of this movie. It is about the journey and what it means about life and what we are; this is not a fast paced action flick with huge gun battles and sword fighting. You must be prepared for a slow, contemplative story if you are to enjoy this movie. The boy does a nice job on the acting front, too. However, he is but a satellite to Viggo’s shining star. The other actors fulfill their roles realistically and with some pathos. No complaints on that front. There are some nice cameos by Robert Duvall (I didn’t recognize him), Guy Pearce and Charlize Theron. The cinematography, suitably in sync with the overall theme, is bleak. Little color is allowed to penetrate the images taking shape before our eyes. All is filtered through shades of gray. Beautiful is not a likely word to describe the cinematography, but we shall arrive at beautifully done for a description. While we never discover an explanation for the apocalypse, it is irrelevant. This is a story about humanity on an individual level. The basis of the plot certainly could be found in other stories throughout time – that is not a knock against it though. It is merely used as a framework through which we learn about the protagonists. This may have earned an 8. It was well done; however, I entered the theater with a bright outlook on our new 2010, and The Road reminded me a little too much of some of my bleak journeys in 2009 that have been put behind me. I do recommend this movie – just expect to be pensive. Thanks. It sounds moody and interesting. I’ll try to check it out when I get a chance. I think I will look out for this movie. The serious take on the post apocalipse genre is under done in my opinion. Don’t misunderstand me I loved mad max and the like, it’s just the genre has so much more to offer. Children of men for example was excellent. I will watch this. Thanks. Thanks again. That’s twice in two days!